Rolex first debuted the Datejust watch in 1945 and since then, the company has made countless versions of their signature dress watch. For instance, there have been plenty of different stainless steel Datejust models produced over the last seven decades. If you’re on the hunt for the perfect pre-owned steel Datejust model but are having a hard time keeping track of what exactly are the differences between the models, read on as we compare steel Datejust models of the five-digit ref. 162xx family with the subsequent—and current—six-digit ref. 1162xx generation of stainless steel Datejust watches. Just ahead of getting into the detailed comparisons between specific models, we’d be remiss not to mention the common design traits that continue throughout each generation of the Datejust watch. Firstly, they have 36mm Oyster cases manufactured to be water resistant to 100 meters thanks in part to screw-down winding crowns and fluted casebacks. Moreover, as the name of the model implies, there’s the famous date window at 3 o’clock accompanied by the protruding Cyclops magnification lens on the crystal. Finally, but perhaps most importantly, Rolex Datejust watches are powered by automatic—aka perpetual—mechanical movements. The stainless steel Rolex Datejust ref. 16200 and ref. 116200 have steel smooth bezels, the ref. 16234 and ref. 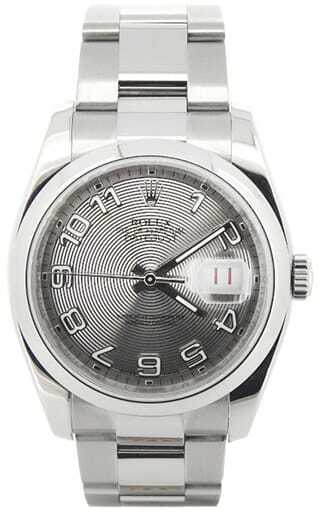 116234 have white gold fluted bezels, and the ref. 16264 and the ref. 116264 have rotating Turn-O-Graph bezels in white gold. At first glance, the older generation of stainless steel Datejust watches (ref. 16200, 16234, 16264) and the newer steel Datejust models (ref. 116200, 116234, 116264) look very similar. However, there are some important differences to note. Rolex produced the five-digit steel Datejust ref. 162xx watches from the late 1980s until the mid 2000s. As modern Datejust watches, these models include scratch-resistant sapphire crystals protecting the dials and run on the Caliber 3135 movement with quickset functionality—where the date window is set independently from the center hands. During its production run, the steel Datejust ref. 162xx watches evolved from having tritium lume on the dials to then featuring Luminova when Rolex began adopting the new material in the late 1990s, to finally, SuperLuminova a few years later. Similarly, these Datejust watches originally had lug holes in the cases until Rolex began phasing them out across all models in the mid 1990s. In terms of bracelets, the five-digit ref. 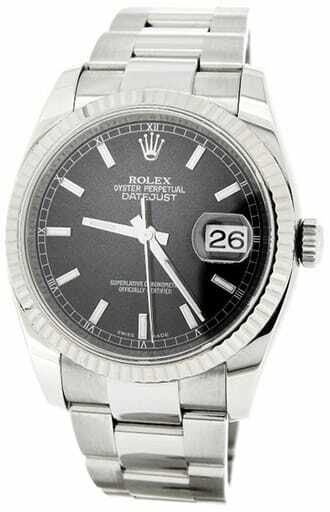 162xx steel Datejust watches came equipped with Oyster or Jubilee bracelets, all with hollow links and flip clasps. Rolex replaced the five-digit ref. 162xx steel Datejust watches with the new six-digit ref. 1162xx steel Datejust watches, which continue to be a part of the brand’s catalog today. An exception to this is the steel Turn-O-Graph Datejust ref. 116264 watch, also known as the Thunderbird, which Rolex discontinued in the early 2010s. These current stainless steel Datejust watches also have sapphire crystals and Caliber 3135 movements. However, since they came later, all these contemporary steel Datejust watches do not have lug holes on their cases and all have SuperLuminova on the dials. The biggest difference between today’s steel Datejust watches and the preceding models are their bracelets. 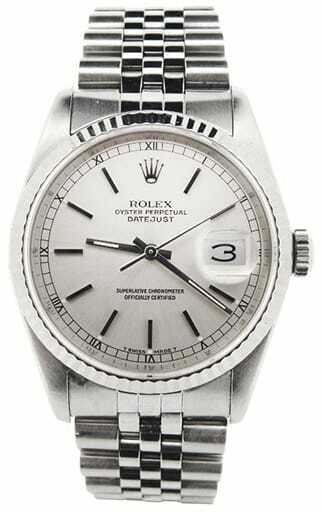 While the previous versions had hollow links, the steel Datejust watches ref. 116200, 116234 and 116264 all have solid links and solid end links (SEL). As a result, the newer models are notably heavier than the former ones. Finally, in the mid-2000s, Rolex began engraving the rehaut—the inner bezel—with ROLEX ROLEX ROLEX as a protective measure against counterfeiting. 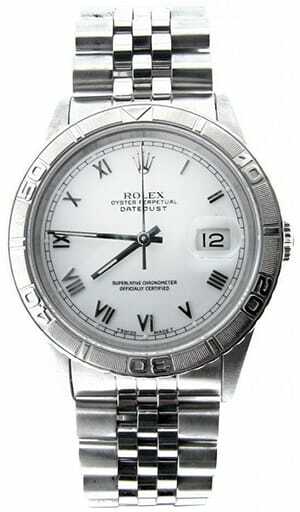 Therefore, you’ll find some six-digit steel Datejust watches with the engraved rehaut and some without. While both generations of the stainless steel Datejust watches run the COSC-certified Caliber 3135 movement with 48 hours of power reserve and a frequency rate of 28,800 beats per hour, Rolex did make big changes in 2015. That year, the company redefined the parameters of their Superlative Chronometer Certification for all watches to include an accuracy rating of -2/+2 per day. Plus, they also extended their warranty from two years to five years. To recap, despite first impressions, the previous ref. 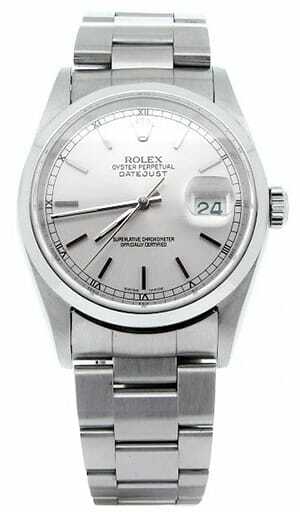 162xx steel Datejust watches can differ greatly from the current ref. 1162xx models—particularly if you compare early versions of the preceding generation. If classic design details such as lug holes and tritium lume are important to you, then the older steel Datejust watches may be right for you. Conversely, if a solid bracelet is your priority, then the newer editions would be right up your alley.